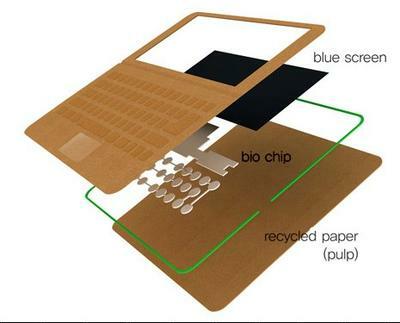 Hoping to tackle our worryingly wasteful disposable culture head-on, designer Je Sung Park proposes a fully recyclable laptop made from paper. 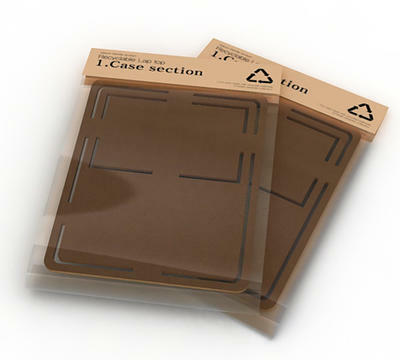 A modular approach would make it a fairly painless process to replace sections of the layered design as and when they became damaged or worn and with the outer casing being made from recycled paper or pulp material, disposal of said damaged or worn parts should have minimal environmental consequences. The designer notes that in a relatively recent development we’re being encouraged to buy cheap throw-away cameras rather than save a few pennies for models that take half-decent images. We’re tempted to hop-on to the bandwagon and go for a bare-bones disposable mobile phone instead of signing up for the latest smartphone. Toss-away tech is (unfortunately) gaining widespread acceptance and isn’t just stuff that fits in the palm of your hand either. But what happens to all this gadgetry when it’s reached the end of its short life? Greenpeace reckons that five percent of all global municipal solid waste is electronic and the Environmental Protection Agency estimates that as much as three quarters of the computers sold in the US are gathering dust in some cupboard or closet somewhere, waiting to be disposed of. Some will be recycled of course but a large percentage will end up in landfill or at the gates of the incinerator, in either case toxic metals and other harmful materials will find their way into our environment. Some more still will be exported to countries in Asia – out of sight, out of mind! 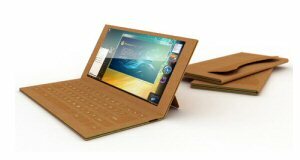 Just like a real notebook (the paper variety), Park is suggesting a simple folding design where the keyboard and screen appear on opposite ‘pages’, the latter supported by a pull-out support on its rear that would rest on a desk or on the lap. Media support and operating systems are subjects that haven’t even been broached and it may be necessary to leave out some of the luxuries that we have become accustomed to (such as WiFi or full HD graphics or Blu-ray optical drive). And although eye-catching, it might not be the slickest or most advanced of tech toys – but that’s perhaps only true if it were to be made at this moment in time. The designer is most definitely looking to the future with this concept. That technology has seen enormous leaps forward in the relatively recent past can’t be denied. As forthcoming advances see components more and more powerful, faster and faster, yet at the same time smaller and smaller (and hopefully not as toxic when the time comes for disposal), the recyclable laptop concept could very much become the must-have portable gadget of tech-savvy generations to come. Is the rising mountain of electronic waste of concern to you? What other gadgets could benefit from an Earth-friendly overhaul?